Endangered bat surveys are one of the many services we offer. Our ecologists are qualified in the identification of U.S. bat species as well as many survey techniques including, mist netting, radio telemetry, harp trapping, pit tagging, transmitter application, emergence surveys, and acoustics. In addition, we conduct winter census and monitoring of bat survivorship with White Nose Syndrome. Staff members are also trained and certified in vertical climbing. In 2012, Ecological Solutions expanded their natural resource services to include endangered bat surveys. In 2013, Ecological Solutions completed 33 projects for the Georgia Department of Transportation. While there were no Indiana bats netted, 25 gray bats and 23 northern long-eared bats were captured within Catoosa, Cherokee, Bartow, Walker, Rabun, and Chattooga counties in Georgia. In addition, Ecological Solutions completed baseline bat presence/absence surveys for North Carolina Wildlife Resources Commission, Chattahoochee-Oconee National Forests, and Cheehaw Zoo. 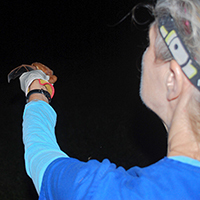 During these surveys, 137 bats were captured which included nine northern long-eared bats, a hoary bat, a Seminole bat, and three silver-haired bats. In 2014, Ecological Solutions is coordinating with the Great Smokey Mountain National Park and Georgia Department of Resources to help with winter hibernacula surveys. 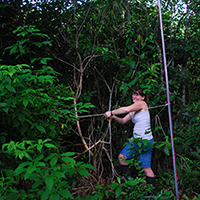 Dottie has eight years of experience working with bats in the southeastern United States and Central America. She has worked in multiple states with many agencies comprising North Carolina Wildlife Resources Commission (NCWRC), North Carolina Department of Transportation (NCDOT), and National Forest and Parks in Tennessee and North Carolina. Work included bat hibernacula surveys, summer netting (mist and harp), roost and emergence surveys, pit tagging, and acoustics. She also helped to establish a baseline bat presence inventory and White Nose Syndrome (WNS) survey protocol for NC, and worked on research projects pertaining to the Indiana bat. Dottie holds a Federal USFWS Section 10 permit. Dottie has over 17 years of experience conducting wildlife surveys for threatened, endangered, and priority species in the U.S. and abroad. Dottie completed her B.S. in Environmental Studies/Ecology at the University of North Carolina. Ryan Malloy has over five years of ecological consulting experience including Indiana bat summer surveys in Georgia following USFWS survey protocols, mist netting and banding, radio telemetry, acoustics, and Geographic Information Systems (GIS), preparing ecology reports, writing protected species reports, and conducting environmental assessments. 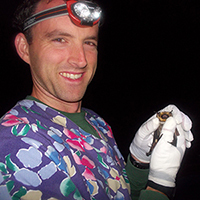 He has also taken multiple bat acoustic training classes focusing on sampling, data collection, and data analysis. Ryan is a senior ecologist at Ecological Solutions and with his familiarity with digitizing, manipulation, data analysis, and map creation, he is one of the lead GIS experts. Ryan completed his B.S. in Ecology and his M.S. In Wildlife at the University of Georgia. © 2009 Ecological Solutions, Inc.